Tea is, still, the nation’s favourite drink and what better gift for the tea loved in your life than a personalised teapot. With the addition of a name, these charming teapots can suit the recipient to a… T.
Of course, many of of us do opt for the convenience of a one cup tea bag straight in to the mug or cup, but a teapot is still a lovely gift whether it’s for regular or occasional use, or even as a charming ornament. 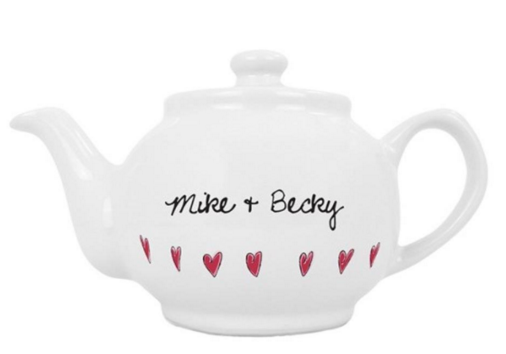 This lovely teapot has a simple pink hearts design and can be personalised with one line of text on the front (20 characters) and two lines on the rear (30 characters per line). It costs about £25 and is dispatched within 3-4 days.